Franz is a longtime independent record label owner who started his own imprint Positive Sound Massive Recordings, a conscious Reggae record label in 1993. Recently Franz founded a 600 label distribution and marketing company Independent Distribution Collective, of which he is currently CEO. He is also a music business instructor at San Francisco’s premiere Electronic music school Pyramind. 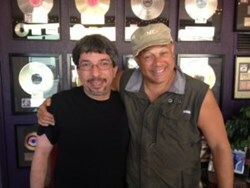 Narada Michael Walden has produced many "household names" including: Aretha Franklin, Steve Winwood, Ray Charles, Wynonna Judd, Whitney Houston, George Michael, Mariah Carey, Barbara Streisand, Lionel Ritchie, Elton John, Sting, Carlos Santana, Shanice Wilson, Tevin Campbell, Lisa Fischer, Stevie Wonder, Tom Jones, Jeff Beck and The Temptations. He was awarded Grammys for Producer of the Year in 1988, Album of the Year for the movie soundtrack The Bodyguard in 1993 and the R&B Song of the Year in 1985 for Aretha Franklin’s Freeway of Love. He was also named as one of the "Top Ten Producers with the Most Number One Hits" by Billboard magazine. Tarpan Records is a new home for many great established artists and some amazing up-and-coming artists as well. Tarpan Records offers artist development, full service project management, promotion, and distribution, and is focused initially on Narada Michael Walden’s releases with a plan to apply this business model to other “up and coming” and established recording artists. In step with the changing face of today’s music industry, Tarpan Records will employ grassroots and online promotional strategies, as well as time tested "industry standard" marketing techniques. "It’s an honor to be working with Narada and Tarpan Records," says Franz. "I look forward to helping develop an amazing roster with a revolutionary music business model, developing new revenue opportunities and changing the game a bit." Tarpan Records will release Narada Michael Walden’s new album Thunder 2013 nationally in late September of 2013, with the help of Franz’s company Independent Distribution Collective. This new album is a Rock masterpiece, with many flavors of Narada’s vast history mixed in. Also in September the label will release Narada Michael Walden’s Rising Sun, an instrumental album. There are at least 2 or 3 new releases following these on the horizon for 2013 and early 2014. Independent Distribution Collective has been a client of AccountingSuite since 2012. AccountingSuite is a San Francisco startup funded by parent company 1C LLC, an international enterprise software group with more than 1 million business customers in Asia and Europe. The AccountingSuite mission is to provide easy-to-use, no-nonsense business software for start-ups, new product companies, and growing businesses to manage their finances and day-to-day operations. The AccountingSuite vision is to give businesses, their employees and business partners easy, secure access to company information from anywhere on the planet—empowering everyone at the company with the business-critical information that often makes the difference between gaining new customers and losing them to the competition. AccountingSuite is cloud-based for easy implementation and low maintenance costs, another way the software helps simplify daily workflow and uncomplicate uncomplicate daily business life.